Have you ever heard of Yorkshire Pudding? Until I saw this bread-like dish on “The Best Thing I Ever Ate” on The Food Network, I hadn’t either. While watching the ‘Best Thing I Ever Made for the Holidays’ episode that was saved on my DVR, chef Alex Guarnaschelli showed us her recipe for roast prime rib with yorkshire pudding. I was inspired! What was this puffy bread made from batter and not yeast?!? 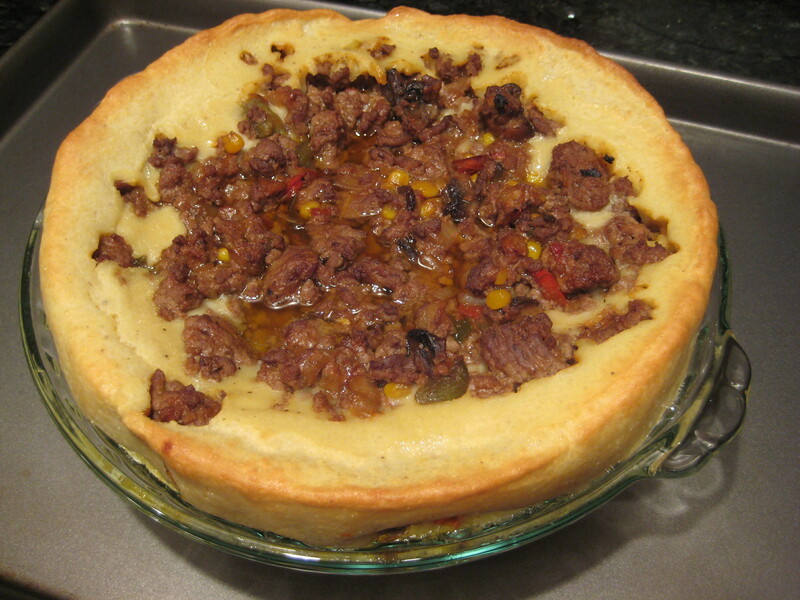 I researched yorkshire pudding online and found out that it is a dish that originated in Yorkshire, England. As we all know, England isn’t exactly known for its food, so I really just had to try it out in my own kitchen. After doing more research, I learned that yorkshire pudding isn’t really bread at all, but more of a popover or souffle. Thanks Google! It didn’t take long for me to put together this yorkshire pudding dish. I had thought about making a traditional pudding with a side of beef, but cooking the meat directly in to the batter seemed more interesting and hearty. I read at least 10 different recipes until I came up with my own and I think it came out exactly like I wanted. 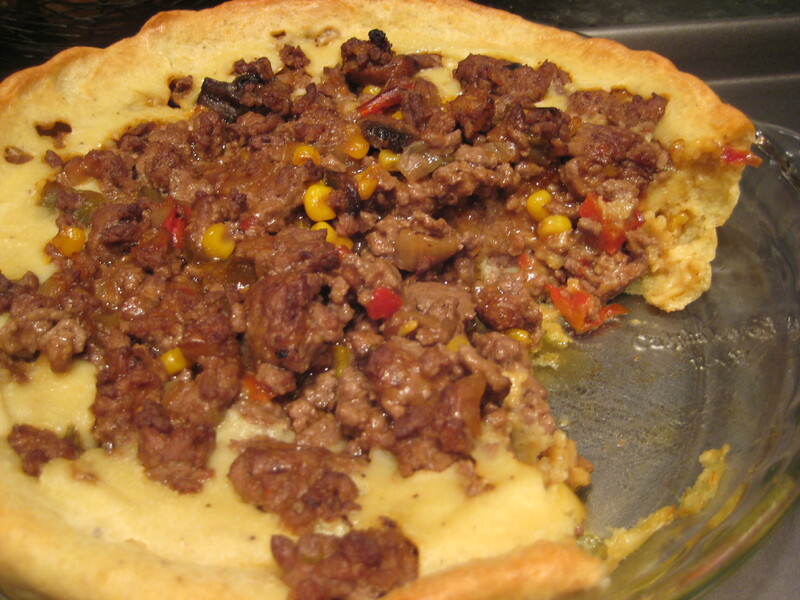 Sweet ground meat, lots of vegetables and a delectable crust. The first thing I did was brown the meat. No oil was needed in the pan since the meat actually cooks in its own oils. This took around 10 minutes. 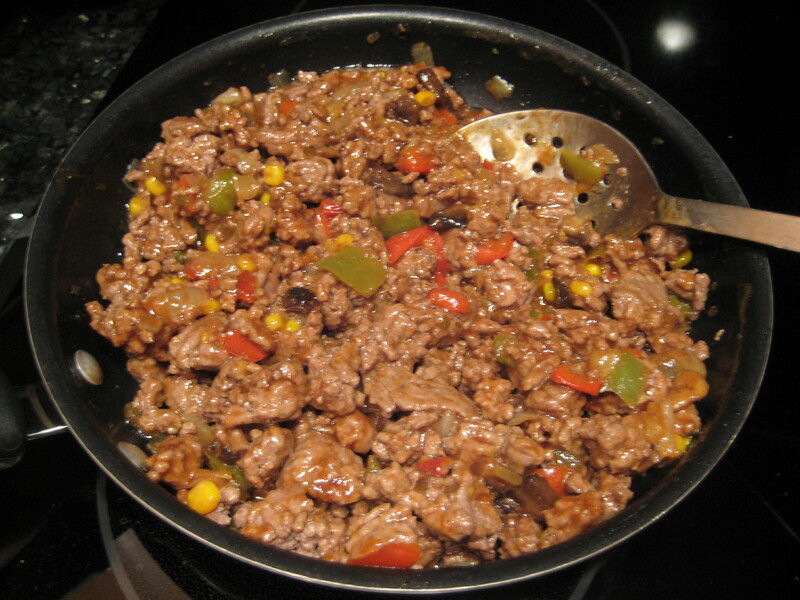 I then drained the meat and added the vegetables, corn relish, BBQ sauce, ketchup, salt and pepper. I mixed everything together and set it aside. I would say the most important part of the process happens now: I placed the margarine in a 10 inch pie plate on a cookie sheet and put it the oven at 425 degrees. Not only will the margarine melt, but the pie plate will get very hot and this will help the batter rise later on. 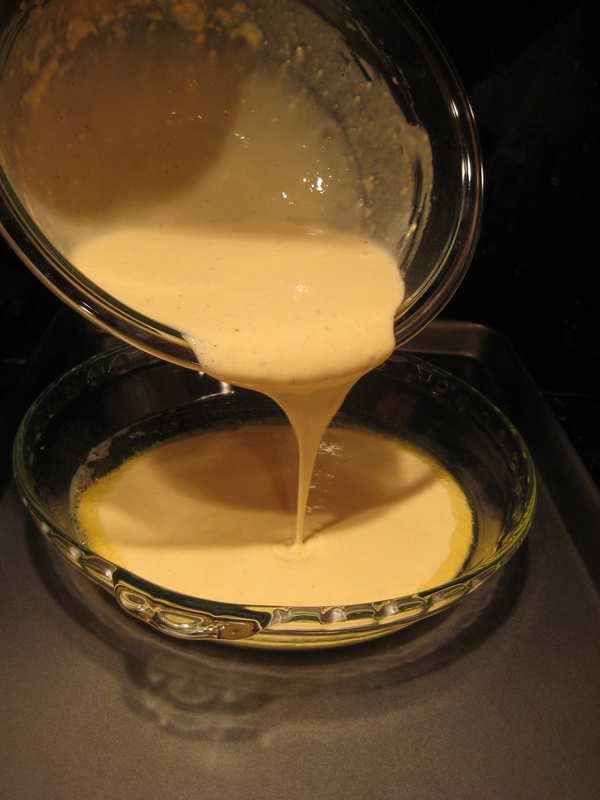 In a bowl, I whisked together the eggs and milk, then added the flour, salt and pepper and mixed until the batter was very smooth. I took the pie plate out the oven carefully and poured the egg mixture in to the hot dish. I then spooned the meat mixture evenly over the batter, leaving an inch around the edge for the pudding to rise. I put the pie dish back in the oven and let it cook for 25 minutes. One good tip that I read is to keep the oven door closed so that the pudding rises. It’s not exactly like a souffle, where you have to be careful every step of the way to make sure the batter rises, but when you make yorkshire pudding, you just need to follow the directions and everything should rise correctly. So really, just leave the oven door closed while the yorkshire pudding beef pie bakes and there’s no way you can mess this up! 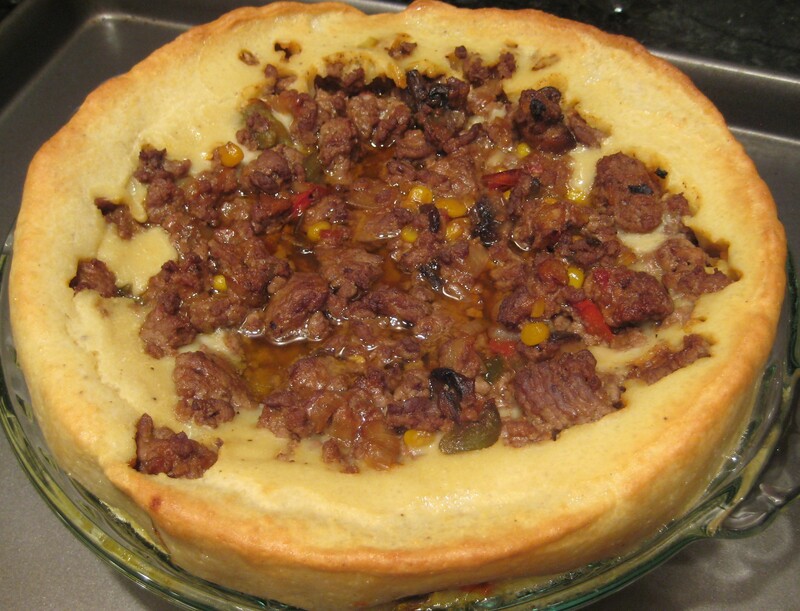 16 Comments on "Yorkshire Pudding Beef Pie"
I might make this for this Shabbos! It should reheat very well. Just keep it uncovered. This would be a great leftover dish for using up post-Shabbos pot roast or brisket. 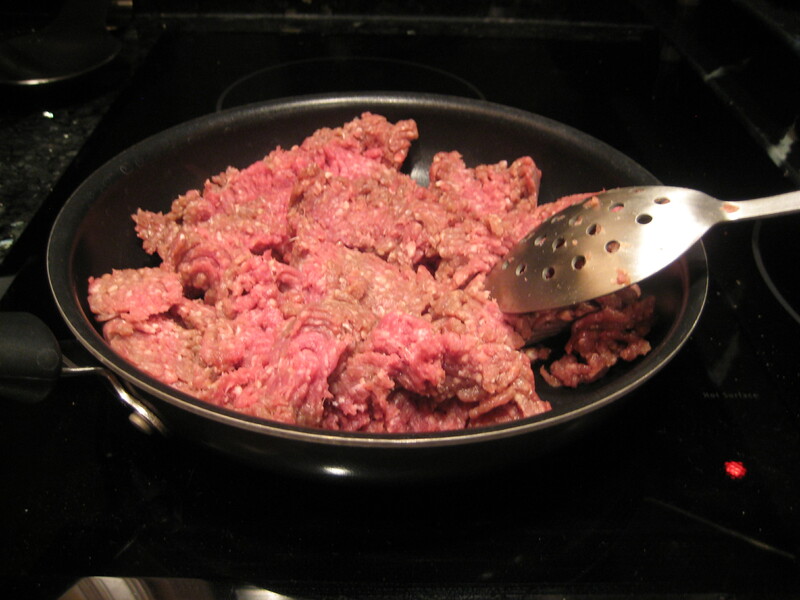 Instead of using the ground meat, you could brown up the leftover meat and use the leftover sauce. You could even use the leftover veggies! Awesome! I usually only have enough leftover to make one more meal, but if I put it in something like this I could stretch those leftovers for another few meals. Thanks Mel! Great idea, Robin!!! You can shred up some leftover chicken in BBQ sauce also. Use good quality sausages instead of the minced beef and its known as "Toad in the Hole" this side of the pond :-) Try this batter mix instead for lighter fluffier puddings 2 cups plain flour A pinch of salt 2 cups eggs 2 cups milk and water mixed 1 tbsp malt vinegar For the Yorkshire pudding batter, sift the flour and salt into a large bowl. Add the eggs and beat well with half the liquid until all the lumps have disappeared. Add the rest of the liquid and the vinegar, and allow to stand. Wow, this looks fantastic! I just got some incredible Jacks Gourmet sausages and I'm going to give this recipe a shot. Any preferred sausage? This was awesome Mel! I doubled the recipe and made it in a 9x13 pyrex. It totally worked. Thanks! This recipe makes awesome yorkshires it never fails...try it you may be surprised that some of us brits know what we're doing with food lol!!! oh! and the sugguestion for toad in the hole's a good one but i wrap my sausages in streaky bacon and do a piigs in blankets in a hole!!! start the sausages in an oven proof pan on the hob till browned and its cooking in its own fat bang in oven at 230C until the pan comes up to temp then chuck the batter in 20-25mins later bobs yer uncle!!! 140g plain flour (this is about 200ml/7fl oz) 4eggs (200ml/7fl oz) 200ml milk sunflower oil, for cooking Heat oven to 230C/fan 210C/gas 8. Drizzle a little sunflower oil evenly into 2 x 4-hole Yorkshire pudding tins or a 12-hole non-stick muffin tin and place in the oven to heat through. To make the batter, tip 140g plain flour into a bowl and beat in four eggs until smooth. Gradually add 200ml milk and carry on beating until the mix is completely lump-free. Season with salt and pepper. Pour the batter into a jug, then remove the hot tins from the oven. Carefully and evenly pour the batter into the holes. Place the tins back in the oven and leave undisturbed for 20-25 mins until the puddings have puffed up and browned. Serve immediately. You can now cool them and freeze for up to 1 month. May I suggest that instead of cooking it in marg you use what we call over hear "dripping" which is basically the fat of cooked meat. Or you can use vegetable oil. I love that idea!!! I would even use coconut oil!